The DENN domain is found in a variety of signalling proteins involved in Rab-mediated processes or regulation of MAPKs signalling pathways. The DENN domain is always encircled on both sides by more divergent domains, called uDENN (for upstream DENN) and dDENN (for downstream DENN). The function of the DENN domain remains to date unclear, although it appears to represent a good candidate for a GTP/GDP exchange activity. The tripartite DENN (after differentially expressed in neoplastic versus normal cells) domain is found in several proteins involved in Rab-mediated processes or regulation of MAPKs (Mitogen-activated preotein kinases) signaling pathways. It actually consists of three parts as the original DENN domain is always encircled on both sides by more divergent domains, called uDENN (after upstream DENN) and dDENN (for downstream DENN). The tripartite DENN domain is found associated with other domains, such as RUN, PLAT, PH, PPR, WD-40, GRAM or C1. The function of DENN domain remains to date unclear, although it appears to represent a good candidate for a GTP/GDP exchange activity [(PUBMED:11563850), (PUBMED:12906859)]. The general characteristics of DENN domains - three regions dDENN, DENN itself, and uDENN having different patterns of sequence conservation and separated by sequences of variable length - suggest that they are composed of at least three sub-domains which may feature distinct folds but which are always associated due to functional and/or structural constraints [(PUBMED:11563850)]. This entry represents the core or cDENN domain. There are 12349 DENN domains in 12344 proteins in SMART's nrdb database. Taxonomic distribution of proteins containing DENN domain. This tree includes only several representative species. The complete taxonomic breakdown of all proteins with DENN domain is also avaliable. Click on the protein counts, or double click on taxonomic names to display all proteins containing DENN domain in the selected taxonomic class. Dual role of DENN/MADD (Rab3GEP) in neurotransmission and neuroprotection. DENN/MADD is a component of a signalling protein complex that is localized to the cytosol and exerts multiple functions by using different binding partners. Human DENN/MADD is physically the same death-domain protein as rat Rab3 GDP/GTP exchange protein (Rab3GEP). DENN/MADD regulates the recycling of Rab3 small G proteins under normal conditions and has an essential role in Ca(2+)-dependent neurotransmitter release and exocytosis. It is also involved in blocking the apoptosis of neuronal cells under conditions of cytotoxic stress. Recent research supports an important role for DENN/MADD in neuroprotection: reduced endogenous DENN/MADD expression and enhanced pro-apoptotic signalling has been found in brains affected by Alzheimer's disease. Molecular cloning, structural analysis, and expression of a human IRLB, MYC promoter-binding protein: new DENN domain-containing protein family emerges small star, filled. IRLB was originally identified as a partial cDNA clone, encoding a 191-aa protein binding the interferon-stimulated response element (ISRE) in the P2 promoter of human MYC. Here, we cloned the full-size IRLB using different bioinformatics tools and an RT-PCR approach. The full-size gene encompasses 131 kb within chromosome 15q22 and consists of 32 exons. IRLB is transcribed as a 6.6-kb mRNA encoding a protein of 1865 aa. IRLB is ubiquitously expressed and its expression is regulated in a growth- and cell cycle-dependent manner. In addition to the ISRE-binding domain IRLB contains a tripartite DENN domain, a nuclear localization signal, two PPRs, and a calmodulin-binding domain. The presence of DENN domains predicts possible interactions of IRLB with GTPases from the Rab family or regulation of growth-induced MAPKs. Strongly homologous proteins were identified in all available vertebrate genomes as well as in Caenorhabditis elegans and Drosophila melanogaster. 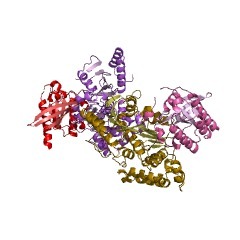 In human and mouse a family of IRLB proteins exists, consisting of at least three members. uDENN, DENN, and dDENN: indissociable domains in Rab and MAP kinases signaling pathways. DENN domains are found in a variety of signaling proteins but their exact function remains undefined. Some of the DENN-containing proteins, such as rat Rab3GEP (Rab3 GDP/GTP exchange protein) or mouse Rab6IP1 (Rab6 interacting protein 1) interact with GTPases of the Rab family. Others, such as human MADD (MAP (Mitogen-activated protein) kinase activating protein containing death domain) and human ST5 (Suppressor of tumoreginicity 5) gene products are involved in regulation of MAPKs (Mitogen-activated protein kinases) signaling pathways. Using a combination of profile-based and bidimensional analyses, we show here that DENN domains are much larger than described to date in domain databases, always encircled on both sides by more divergent domains, that we called uDENN and dDENN. These however share conserved amino acids which could play a key role in the DENN functions. The human DENN gene: genomic organization, alternative splicing, and localization to chromosome 11p11.21-p11.22. We have previously isolated and sequenced the cDNA of a novel gene, DENN, that exhibits differential mRNA expression in normal and neoplastic cells. The open reading frame of 4761 nucleotides encodes a putative hydrophilic protein of 1587 amino acids with a calculated molecular mass of 176,431 Da. Within DENN cDNA lies an alternative exon segment of 129 nucleotides encoding 43 amino acids, which may be excluded from some transcripts by alternative splicing. The serine- and leucine-rich DENN protein possesses a RGD cellular adhesion motif and a leucine-zipper-like motif associated with protein dimerization, and shows partial homology to the receptor binding domain of tumor necrosis factor alpha. DENN is virtually identical to MADD, a human MAP kinase-activating death domain protein that interacts with type I tumor necrosis factor receptor. DENN displays significant homology to Rab3 GEP, a rat GDP/GTP exchange protein specific for Rab3 small G proteins implicated in intracellular vesicle trafficking. DENN also exhibits strong similarity to Caenorhabditis elegans AEX-3, which interacts with Rab3 to regulate synaptic vesicle release. Composed of 15 exons (ranging in size from 73 to 1230 bp) and 14 introns (varying from about 170 bp to 5.3 kb), the DENN gene is estimated to span at least 28 kb. The alternative splicing event was traced to an alternative 5' donor site involving exon 7. DENN was mapped to chromosome region 11p11.21-p11.22 by FISH. Using polyclonal antibodies against a synthetic peptide, Western blotting of MOLT-4 T-lymphoblastic leukemic cell proteins and immunoblotting of subcellular fractions of MOLT-4 cells and PLC/PRF/5 liver cancer cells yielded data corroborating the alternative splicing mechanism that generates two variant isoforms of the DENN protein that display differential expression in cells of different lineages.